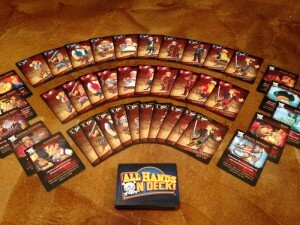 Salamander Games is running a Kickstarter campaign for All Hands on Deck, their new pirate-themed card game. In All Hands on Deck!, each player takes the role of a pirate captain that is in port trying to replace lost crew members at the local tavern. You must carefully manage the crew you already have and outbid your opposing captains to acquire the sailors you need. You will also need to seize opportunities to play action cards where they will secure the greatest advantage at the auction block and outwit your fellow captains. Be the first to replenish your crew and put back out to sea with a shout of 'ALL HANDS ON DECK! '.